How many people's first glimpse of Australia was Crocodile Dundee?! It was for us - a funny insight into a completely different world. For those who don't know, Crocodile Dundee was filmed in the 'Top End', two hours from Darwin at the northern most point of the Northern Territory. This pristine wilderness is only a stone's throw from Indonesia, and packs in many of the experiences that foreigners see as synonymous with Australia. 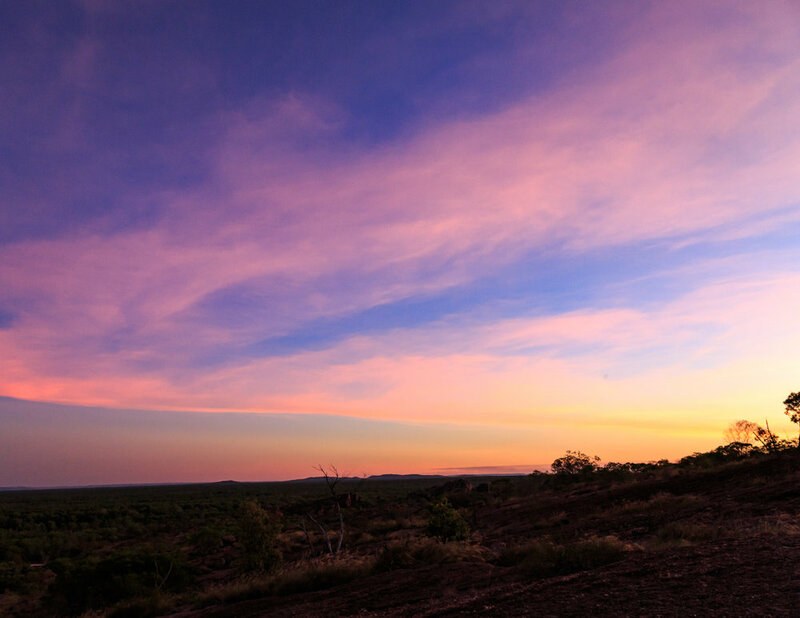 Rugged landscape, indigenous art and culture and plenty of wildlife watching opportunities. While much has changed over the years the scenery is still as jaw dropping as it was in the movie. 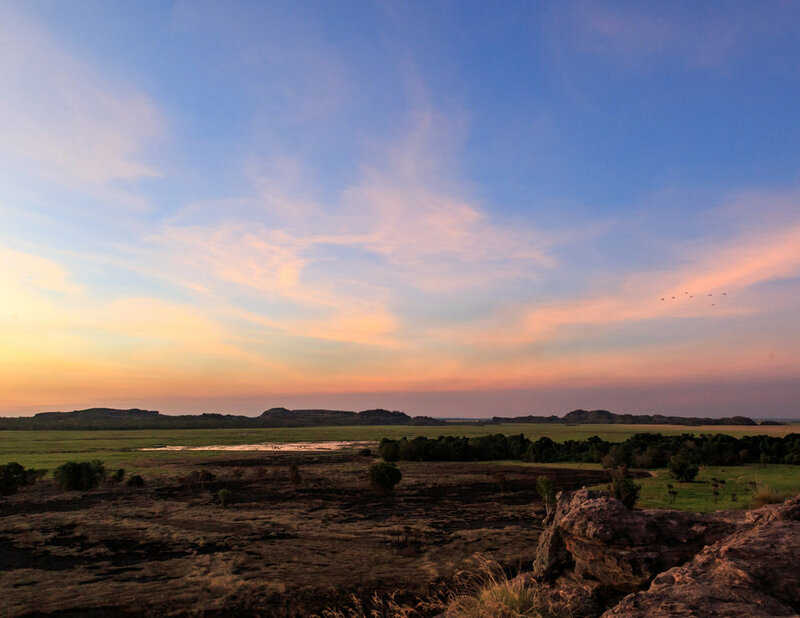 Kakadu National Park is the jewel in the crown of the Top End, and should be on any nature lovers' itinerary. Access to the national park has become much easier since the film aired over 30 years ago and it's now one of Australia's top places to visit. We loved this boat trip so much that we did it twice. Lucky for us when you've paid for the first one all subsequent cruises are $25pp. The sunrise trip is really beautiful and the best time to see the many bird species. You'll definitely spot the odd croc but the focus of the tour is the birdlife. You will stop at a good vantage point to watch the sunrise and it's amazing how still and calm the water is. It's a very special experience. You might also spot brumbies (wild horses) and buffalo (which are actually a pest) but we weren't so lucky. If you have the chance we'd also recommend going at sunset. The crocs are far more active, we saw huge numbers. Keep an eye out for alpha male Maxi who usurped his predecessor by chomping on his head, eeek. The sunset was also one of the most spectacular we saw on the whole trip. The trip will finish before all the colour has but you can stay on the bridge until the last rays... or until you can stand the mosquitoes no more! 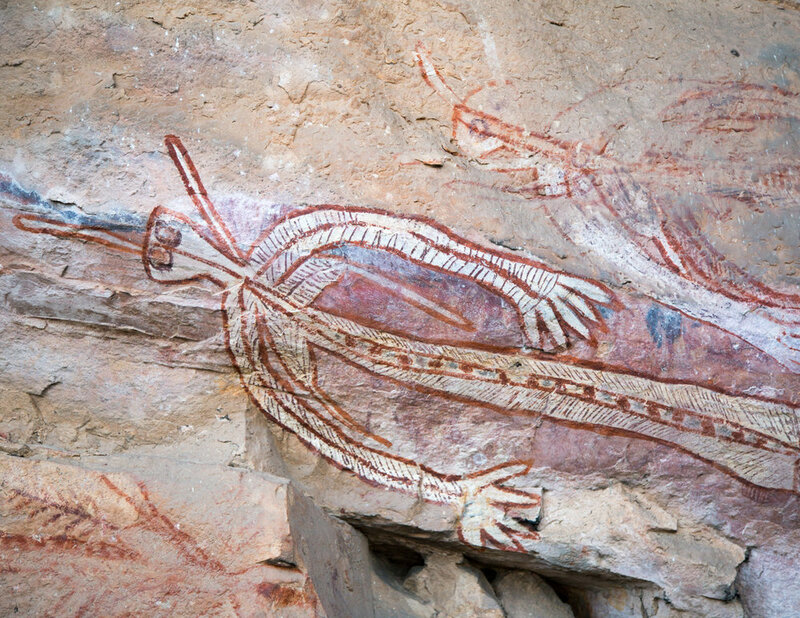 If you want to see ancient aboriginal rock art, then head straight to Kakadu. At Ubirr and Nourlangie you'll find some of the best preserved and most vibrant aboriginal rock art in the whole of Australia. Many of the paintings in these galleries are over 20,000 years old, and the stories that are passed on over generations are fascinating. They are so bright and vivid and still in incredible condition. Many people come to Kakadu for the rock art alone. 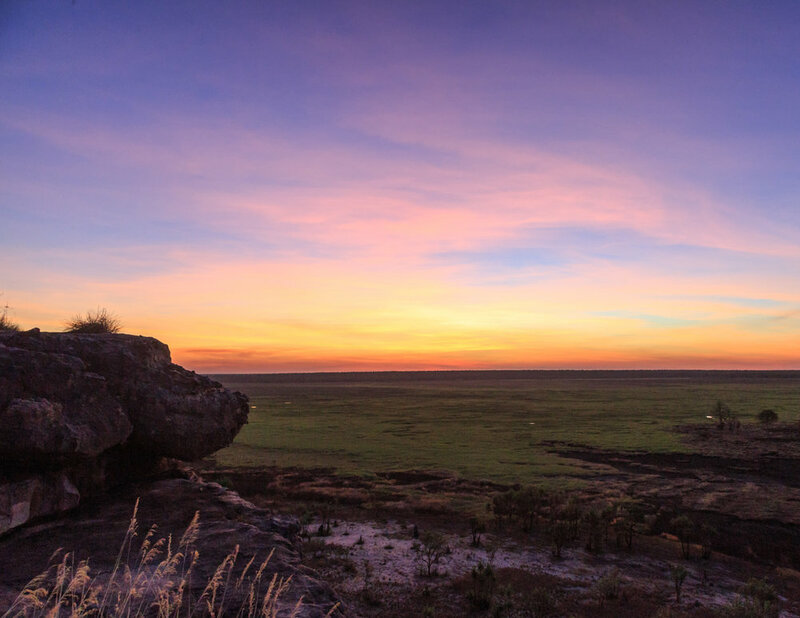 There are few places to take in the sunset like Ubirr. Make sure you arrive in time to thoroughly explore the rock art before making your way to the hill to sit and watch the sun go down. It's a popular activity but the area is vast so you can easily find a crag of your own and pretend you're the only ones there. The park actually closes at 7pm and the gate is locked, so be prepared for a mad dash back to your car so you don't get locked in. Very close to the gate there is a general store which serves great Thai food. It was the best meal we had in Kakadu so it makes for a good combo with an Ubirr sunset. 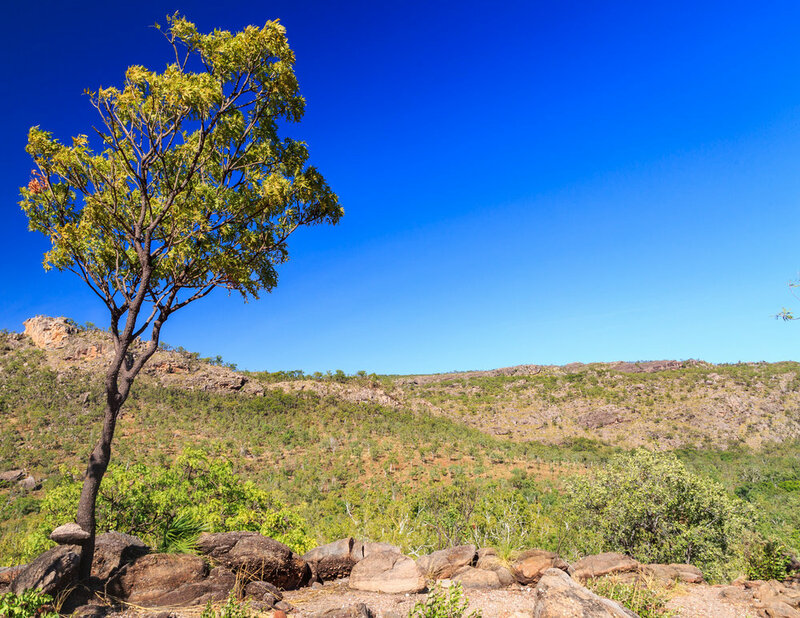 We love this walk, Kakadu has some great hiking but most of the trails are pretty short, if you're a keen hiker this is definitely the track for you. They don't recommend starting after 8am due to the heat and the track is pretty exposed so we were glad we took this advice on board. The walk starts at the Nourlangie rock art site, we arrived at 7am to spend an hour exploring the site before starting the track. It was actually the perfect time to arrive because there were only a couple of other people there, marked contrast to Ubirr in the late afternoon which was hugely busy. It's also your best chance at seeing the rare Baark wallaroo. We were lucky enough to catch sight of one and watch it for a while before it got shy and hopped off. We did not see another soul on this entire 12km track which is staggering given how beautiful it is, and how popular Kakadu is. You really felt like you were in true outback wilderness and it had me yearning to walk the Larapinta trail one day. The walk starts off quite steeply as you ascend to the top of the cliffside, and the views are spectacular. There are some exposed sections which can give you a serious case of jelly legs! There are a few steep downhill sections on loose rock so walking poles would come in handy. At around the half way mark you come to the Nanguluwur art site. The art here is particularly well preserved. It was quite confronting to see the pictures of tall sail boats take over from the indigenous animals and spirits. This seemed to be quite a quiet site, probably due to the fact that the nearest car park is a 3.4km round trip away, whereas most of the other sites require very little walking. From the rock art site it is a very easy walk back to your car, through sandstone outcrops and open woodland. This was perfect for us as it had started hotting up by this point. Overall, we'd definitely recommend this walk, there is a fair bit of up and down in the first part of the track and some exposed edges and uneven terrain but definitely doable if you' have a little bush walking experience. 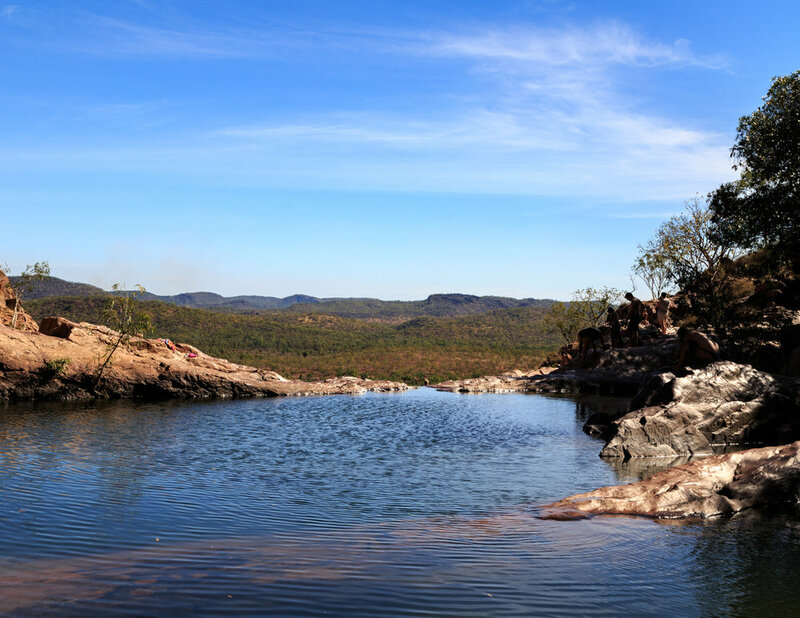 It's a tough call but this is possibly our favourite waterhole of them all. In a national park full of sublime spots this is really high praise. You access the falls via an 8km return walking track, so this is a waterhole you can visit later in the day and still be likely to have it to yourself, or shared with just a few others. The colour of the water almost looks fake, like something straight out of a fairy tale. There are also several small waterfalls running into the pool. You access the pools by climbing behind the rocks that you will see when you first arrive at the creek. That just adds to the feeling that you've stumbled upon a a very special place. This has to be one of the most spectacular and unique infinity pools we've ever been to. A short but very steep 500m walk takes you up to a series a falls, each with a picture perfect swimming hole. Our favourite was the one with the view over the plains. Really, it doesn't get much better than this. There are also pools just five minutes from the car park but these are known to be croc haunts and we wouldn't advise swimming here (though we saw people who were). It's a beautiful spot though, and well worth a look. 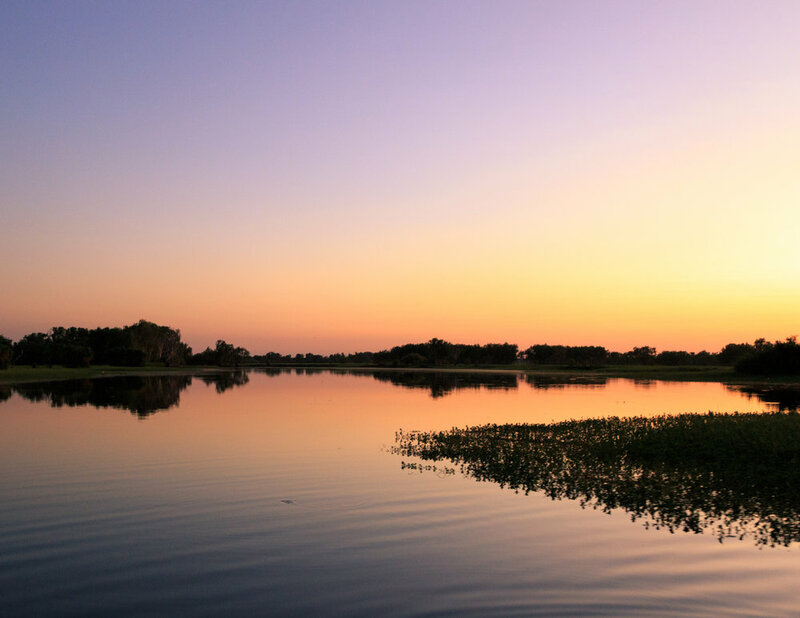 Ubirr is the most famous sunset spot in Kakadu but if you're there for a few days we definitely recommend checking out Nawalandja too. 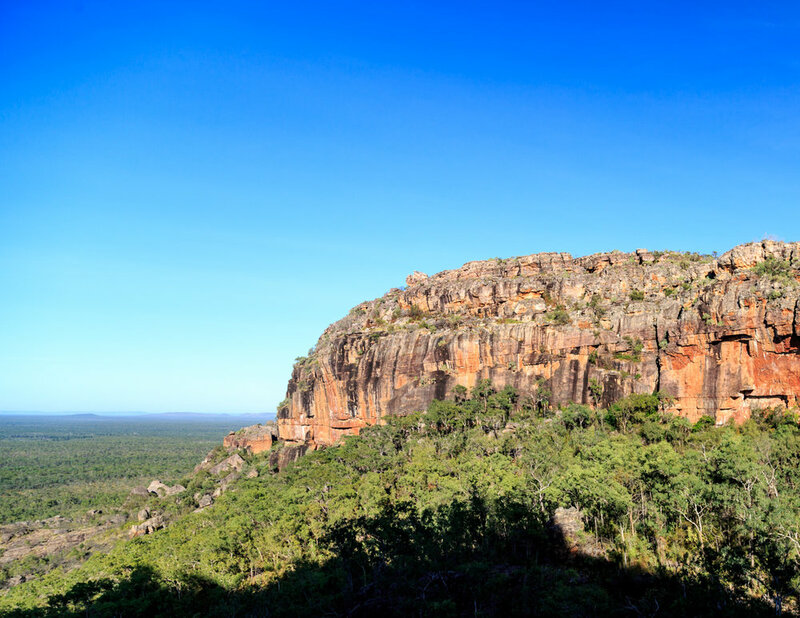 It's just a 300m leisurely climb from the car park to the top of the rocky plateau, offering amazing views over the plains and Nourlangie rock. Unlike Ubirr there are no gates here so you can stay for as long as you like, soaking up the last of the rays. There were only a couple of people here when we visited and the plateau is huge so it still had that alone in the wilderness feel. It is a very beautiful, calming experience to watch the sun slowly light up the rocks in the distance. This easy 6.5km loop track gives you a great overview of the surrounding countryside. It follows on from the shorter Bardedjilidji Walk (2.5km), which was actually our favourite part of the track so if you're short on time you could just do this loop. The Bardedjilidji track takes you round a series of sandstone pillars, which feel like you're wondering through an ancient man made city, nature is so spectacular! The rest of the walk largely follows the East Alligator River, and is very pretty, though at times I found the proximity to the croc infested water rather alarming! It's also a good spot for spotting white bellied sea eagles. The routes are different depending on whether you are visiting in the wet or the dry so make sure you check the website closely, but a scenic flight over Kakadu and Arnhem Land is amazing. The wet season route looks far more spectacular as you pass over many of the waterfalls. In the dry you are largely flying over escarpment and flood plains which is beautiful in its own right, but there are no waterfalls which was a tiny bit disappointing. It's a great vantage point for spotting wildlife though, and we saw heaps of crocs and brumbies which was fantastic. It's also the only real way you can get any idea of the scale of the park too, which is simply staggering. I would love to try this flight again in the wet, one for next time! 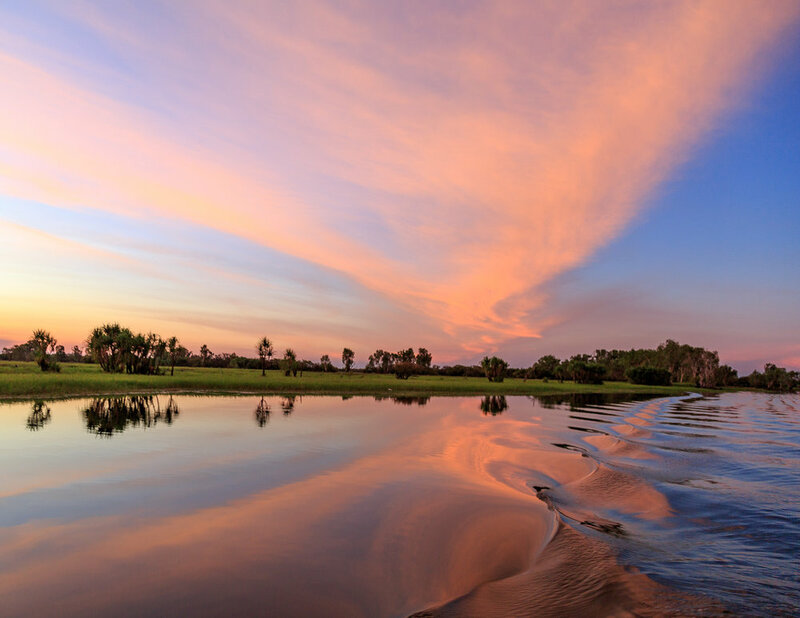 It's worth noting that Kakadu has two distinct weather patterns - the wet and the dry season- that will affect what you can do when you visit. The wet season runs roughly from October to March and can flood much of the area, meaning a lot of the attractions will be inaccessible. Some are year round though, including several of the rock art sites and yellow water river cruises, and the benefits are that there will be fewer visitor numbers than in the dry. We'd love to go back to experience a scenic flight over the roaring waterfalls too. 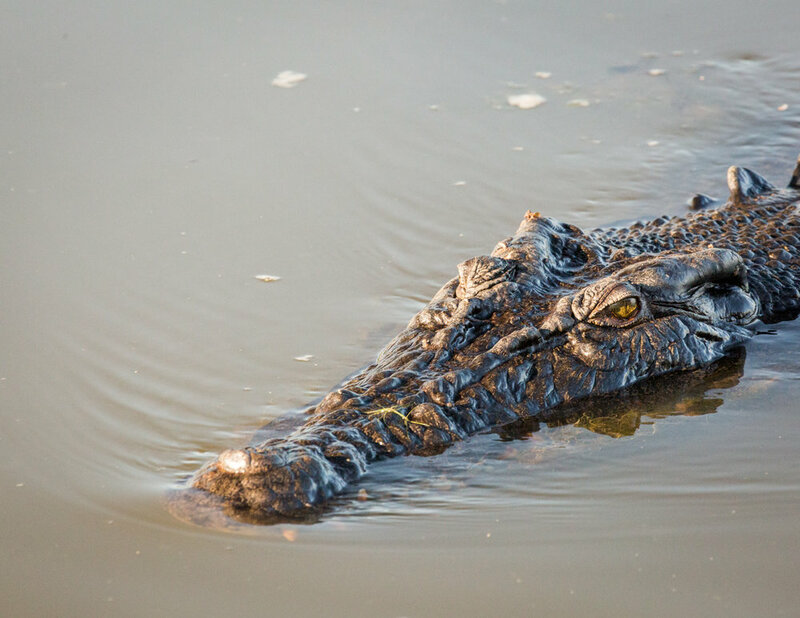 Most people do choose to visit in the dry though as this is a time when you can access everything including the waterholes which can see crocs in the waterholes during wet season. It's also a good time to see wildlife as they tend to congregate around the few waterholes that are left. The park entrance fee is $25, good for 14 days, and should be purchased as soon as you arrive at the visitor centre. We ummed and aaaahed over getting a 4wd as they are so much more expensive to rent, in the end, we did and didn't regret it. Some of the waterholes are not accessible to 2wd unless you are prepared to risk serious damage. We wouldn't have taken a 2wd to Gunlom falls or Motor Car falls for example. Unfortunately, our car rental agreement despite being for a 4wd prohibited us visiting Jim Jim and Twin falls - much to our disappointment. Check your rental agreement carefully as we heard rumours about cars being fitted with trackers and fines handed out for those who did take them there - this might not be true but we didn't want to try our luck. Another thing to be aware of is that all rental companies put a cap on the amount of free kilometres you can drive per day (this tends to be 100km). After this you'll start paying per kilometre you go over. This can be frustrating as the distances are quite long and you'll fly over this limit, so account for this before you arrive. We're not going to lie, you don't come here for the food. There is a great supermarket in Jabiru though so if you have access to cooking facilities or you want to make your own lunches you'll be fine. Sadly since our visit, the village bakery has closed down which was our go to for lunch. The only restaurant we'd recommend (and I think we tried them all given we were there for seven days) was the Thai food at the general store. Like all food in Kakadu, it was expensive but the portions were so big it did us for lunch the next day. Small eaters should definitely share! The next best would be the food at the Cooinda lodge if you are staying out that way, or after you finish the sunset yellow water cruise. We were in Kakadu just over a week in total and ended up trying several different accommodation options. This was a nice midrange option, clean and large rooms with all the usual amenities. A similar hotel would be much cheaper in other parts of Australia, but all accommodation in Kakadu National Park are overpriced. The hotel is in Jabiru which is well placed near to the supermarket and roughly 45 minutes drive from both Ubirr and Yellow Water (in between both). This hotel was in a lovely leafy and shady area, very close to where the yellow water river cruises run from (you buy your tickets from here). The rooms are individual freestanding cabin types. They are spacious but for us, that's where it stopped. Edit: Cooinda lodge is currently in the process of a full refurb, exciting news if you're heading to Kakadu later in the year! They were quite dark and dingy and a few cockroaches were scuttling around. This was a shame because the restaurant was better than any in Jabiru. If you are doing a yellow water sunrise cruise, we'd still recommend staying here as otherwise, the early start from Jabiru would be fairly brutal. 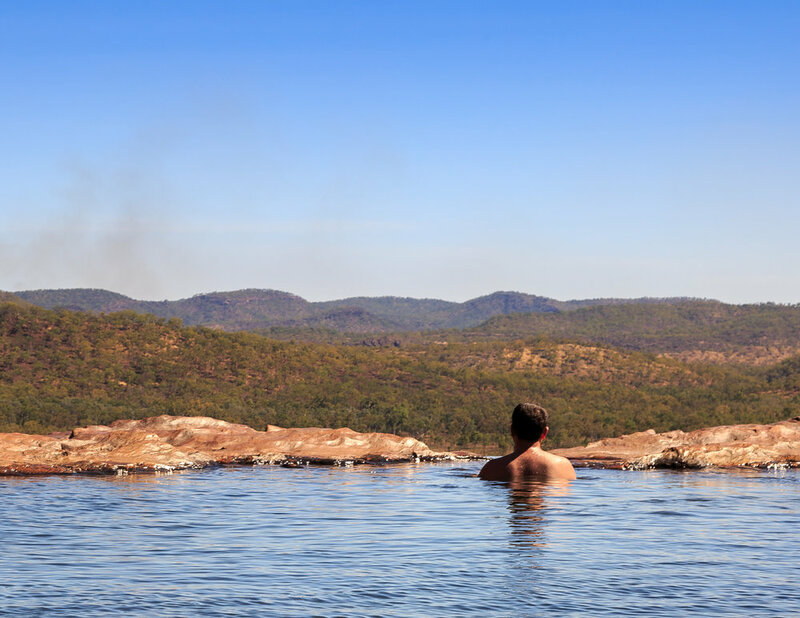 The location is also very good for visiting some of the water holes, such as Gunlom and Motor Car falls, which make a very long day trip from Jabiru. This was by far the cheapest and best value option we stayed in, in Kakadu. The bush bungalows are fairly compact and though they have a private bathroom, it is not actually attached. It's only around a 30-second walk though and each room has a key to their own. It's fan only so if you can't do without AC it won't be for you. We found it very charming and they even squeezed in coffee and tea making facilities which was a bonus. The setting is lush garden and you can use the shared BBQ facilities. Like the Mecure it is also situated in Jabiru. Ever been to Kakadu? Have you visited in the wet season? Let us know in the comments below.